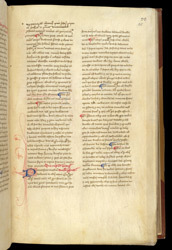 Top left of the page, two small crosses with dots in the angles of their arms indicate a correction. The lines of writing after the cross in the upper margin are meant to be inserted at the point where the second cross was written at the end of the first line. Medieval scribes developed symbols to indicate all types of corrections out of necessity. Hand copying meant mistakes were common.